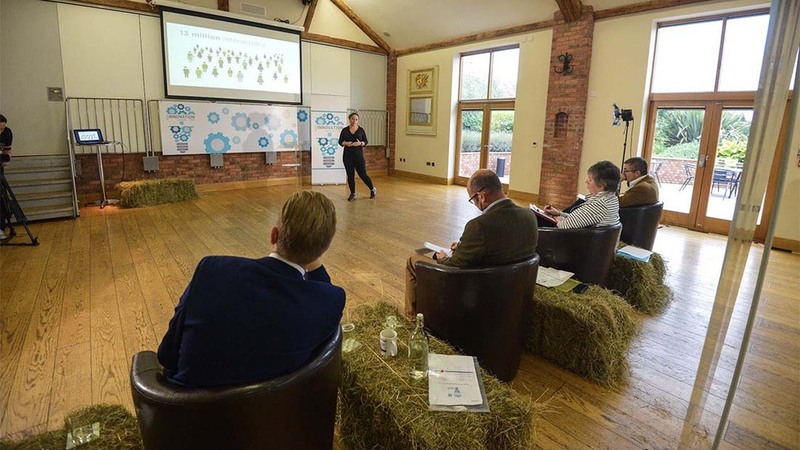 Agri-Innovation Den 2016 has proved an enormous success with the majority of finalists receiving commitment from the judges for further talks on business development opportunities. Six finalists pitched their business ideas at Wootton Park, Warwickshire, today to our four judges: Neil Thackray, CEO of Briefing Media; Emma Penny, Briefing Media group editor; Will Jackson, agricultural development manager for The Co-Operative Food Group, which sponsors the competition, and Jake Freestone, manager of Overbury Farms. All four judges were in agreement the day had been truly inspiring: Mr Thackray said: "The quality of businesses and level of innovation was extraordinary. Every single one for them was doing something which will change how people in agriculture work." Favourites with the judges were WeFarm, a knowledge-sharing platform for smallholders across the world and AOX, a simple-to-use futures trading platform for the agricultural market. Mr Jackson said from The Co-operative Food Group’s point of view WeFarm stood out. "What they have done in such a short space of time is extraordinary." He said it was ethical and global and a great fit with for them. Mr Freestone agreed WeFarm stood out for him too. "To be able to share and disseminate agricultural knowledge in developing countries has got to be a good thing." See Farmers Guardian in the coming weeks to find out how all the finalists got on and for more about the competition and the finalists, visit www.aginnovationden.com.